Bangalore Days malayalam movie (film) directed by debutant Anjali Menon will feature Dulquer Salmaan, Fahadh Faasil, Nivin Pauly, Nithya Menen, Nazriya Nazim, Parvathi Menon and Isha Talwar in lead roles. Vijayaraghavan, Kalpana, Maniyanpilla Raju and Sajid Yahiya would give life to other prominent characters in the movie. This story revolves around the life of three youngsters who crossover from Kerala to Bangalore having high dreams to explore the unidentified. 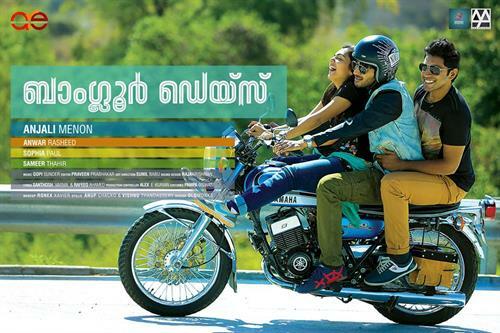 Bangalore Days is not just a movie but the celebration of the youth. Directed by debutant Anjali Menon, the movie made news for the presence of the young bloods while its popularity rose after the engagement of Fahad Fazil and Nazriya Menon. Touted to be an out to out entertainer, the movie is themed around the four characters who reached Bangalore with wide range of dreams. 'Bangalore Days' actually deals with the travelogue of each common man in achieving their life goal. This story revolves around the life of three youngsters who crossover from Kerala to Bangalore having high dreams to explore the unidentified. Arjun(Dulquar Salmaan) Divya (Naziriya) and Kuttan (Nivin Pauly) are relatives who belongs to an old Tharavadu. Coming from different social back grounds, all of them reach Bangalore in almost same time. Even though they arrive at Bangalore together, their plans at Bangalore were totally different. The change that happens in their character after reaching Bangalore is the main highlight of this movie. As Das (Fahadh) and the character played by Nithya Menon accompany them during their journey, the movie takes an important shift which takes the movie to the next phase. It has also been reported that a scene where Fahad Fazil marries Nazriya Nazim has been shot in the movie. To keep the secrecy of the shooting of the movie, mobile phones were kept away during the shooting. Nithya Menen, Nazriya Nazim, Parvathi Menon and Isha Talwar will be seen in prominent roles. Vijayaraghavan, Kalpana, Maniyanpilla Raju and Sajid Yahiya would give life to other important characters in the movie. Made with a whooping budget of 8.5 Crores, the movie will be an ultimate entertainer. Gopi Sunder has set the tunes for this fun filled movie. 'Bangalore Days' has been produced by Anwar Rasheed under the banner Anwar Rasheed Entertainment. Shot in Ernakulam, Bangalore, Pondicherry, Chennai and Hyderabad, the movie will reach theatres on 9th May 2014.